Working in a Brockton elementary school, Kathleen Smith tried to hold the attention of large classes — as many as 35 grade-schoolers in one big room. And conditions were deteriorating. At Brockton High School, she remembered, "you truly had kids that would come in and sit on the radiators," she said. "You had books falling apart. You didn’t have materials. You didn’t have supplies." Conditions like those led students in Brockton and 15 other cities and towns to sue Massachusetts. They argued that the state, by failing to provide thousands of students the opportunity to receive an "adequate education," was violating the Massachusetts Constitution. Communities like Brockton had been arguing for years that they were underfunded, particularly when compared to wealthier communities; the litigation trail extends back into the 1970s. But the funding disparity between Massachusetts' wealthiest districts and its poorest had grown incredibly wide. 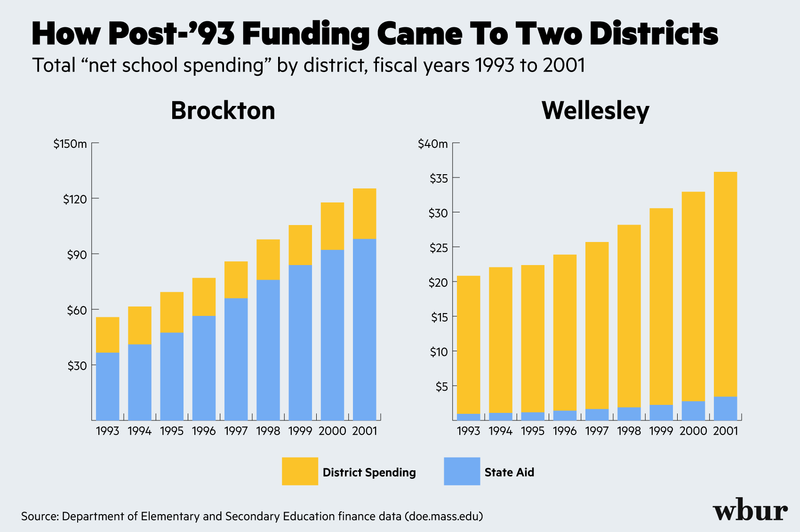 In 1993, Brookline spent $7,772 per student, while Brockton spent $4,090. By 1993, contemporary onlookers expected that — finally — Brockton and its co-plaintiffs might win their case. At the same time, state business leaders were calling for a bigger investment in education. They had escalating concerns of their own: about whether the state was adequately preparing the workforce of the future. "If the commonwealth is going to be competitive in the 21st century, we need to re-engineer education," Paul Reville recalled. In 1993, he was the executive director of the Massachusetts Business Alliance for Education (MBAE). Jack Rennie, who owned a small technology and consulting company in Burlington, founded the organization in 1988. He had seen firsthand how challenging it was to find new employees with the right kinds of skills. For Rennie, the solution was clear: better public education. If we don't give educators the funding they need or clear away some of the regulatory obstacles they face, we can't fairly call them to account if they fail to produce results. But if we don't find ways to hold them accountable for results and to reconstitute schools which fail, there is little point to investing additional funds in our schools. All that set the stage for a "grand bargain" to be struck, said Reville, who later served as state education secretary and currently teaches at Harvard University. The primary agents of that bargain were the two co-chairs of the Legislature's Joint Committee on Education: Rep. Mark Roosevelt and Sen. Tom Birmingham. As he urged his colleagues to vote on the bill they assembled in 1993, Birmingham told his colleagues they had no time to waste: “Too many of our kids are mired in systems of mediocrity or abject failure." And indeed, on June 15, 1993, the Supreme Judicial Court ruled in favor of students. Chief Justice Paul Liacos wrote for the majority that "the Commonwealth has a duty to provide an education for all its children, rich and poor, in every city and town of the Commonwealth at the public school level." 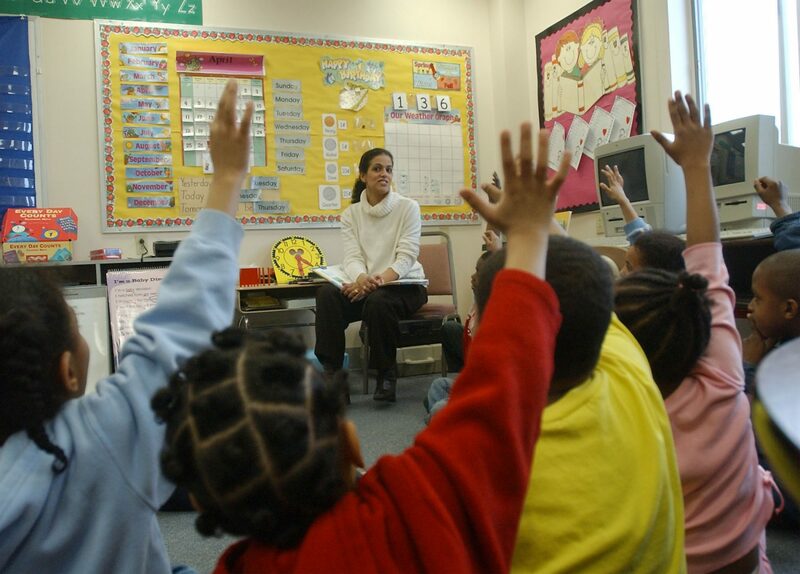 ...while the present statutory and financial schemes purport to provide equal educational opportunity in the public schools for every child, rich or poor, the reality is that children in the less affluent communities (or in the less affluent parts of them) are not receiving their constitutional entitlement of education as intended and mandated by the framers of the Constitution. Three days later, Gov. William Weld signed the Education Reform Act into law. That law reflected the "hand-in-hand" approach proposed by state business leaders two years earlier. First, it overhauled the way schools were funded. Before, education funding had been mostly on a given district's revenue from property taxes. That meant wealthy communities ended up having a lot more to spend on their schools than did their less affluent neighbors. The law pumped $2 billion into public schools over 10 years. A much larger percentage went into poor districts, but every community got at least a little bump in funds — which likely helped sell the bill to lawmakers around the state. 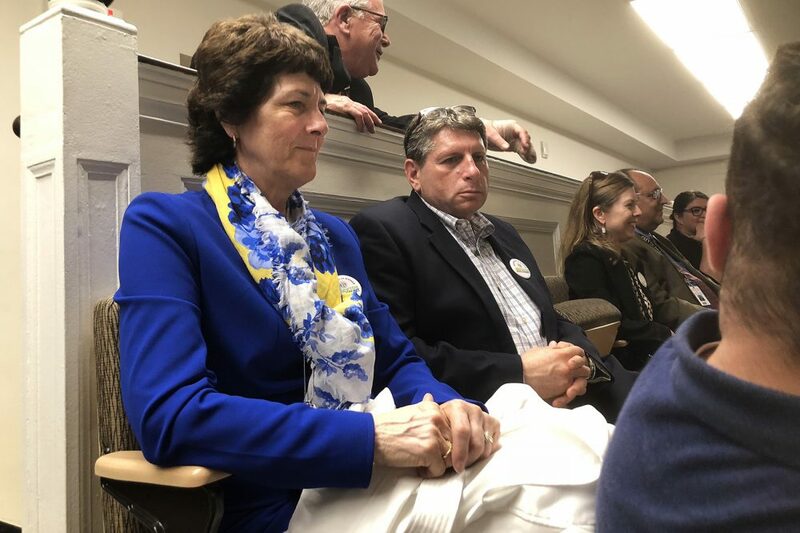 Recently, some lawmakers have been pushing to update the new funding mechanism, and a funding bill has passed the state Senate. But it's the other side of the “grand bargain” that has proven more controversial: the accountability measures it introduced. The first of those was the Massachusetts Comprehensive Assessment System, or the MCAS test. It would become a dominant and high-stakes metric of school performance in this state (though the original bill did not specify the nature of that test, or exactly how it should be used — that came later). "I look back at pre-1993, pre-ed reform, we had certain hunches on which schools were doing well and which were not — but we didn’t have any data to back that up," Birmingham said. "You cannot continue to cut our funding and expect that the schools can continue to do the jobs that they were doing in the mid-'90s and early 2000s. We are hanging by a thread." Once MCAS was rolled out, state leaders finally had a way to measure growth across every school. But at the same time, the earliest results confirmed some of Birmingham and Roosevelt's apocalyptic rhetoric: Some communities and demographic groups scored far below their wealthier suburban peers. But as the extra funding arrived, other areas of the schools improved. “Now you’re having adequate class sizes. Now you’re bringing in strong, researched curriculum. Now you’re providing after-school,” Smith said. Smith is still with the Brockton Public Schools. Now, she’s the superintendent. While the district’s costs are rising, Smith said Brockton is keeping its commitment to students, pointing to its MCAS test scores as well as its award-winning arts programs. But Smith argues that the state isn't keeping up its end of the bargain. Today, she says she is seeing many of the same problems the district experienced in the 1990s crop back up again. Class sizes, for example, are creeping up. Which is why Brockton is considering suing the state once again. Worcester is considering similar legal action. 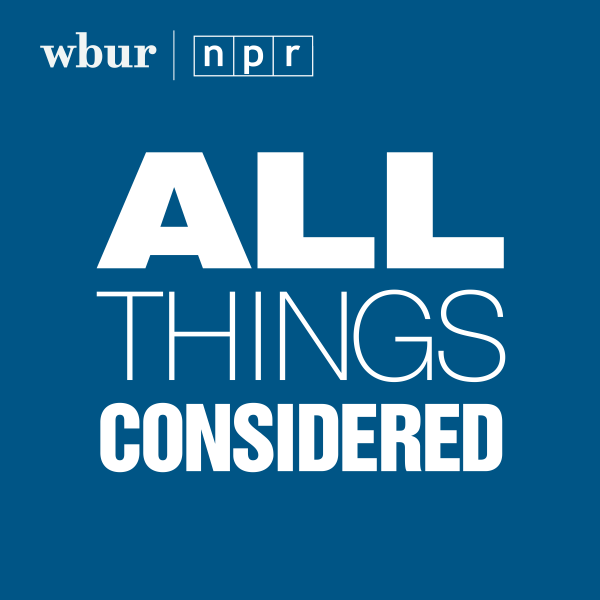 Join our Facebook group to continue the conversation with other parents, teachers, administrators and WBUR's education reporters. This segment aired on June 18, 2018.